Cell phones aren’t a cheap purchase, and for many of us, they’re an invaluable part of our daily lives. Unfortunately, they’re also easily damaged. Drop your smartphone on a sidewalk, and you pray for no cracks. Drop it in water, and it’s often toast. Mobile phone insurance and extended protection plans can help ease that financial blow — especially if you have carefree kids with pricey smartphones. After all, a cracked screen alone can run you $200+ to repair without insurance. With that said, it’s not easy to find the best cell phone insurance. Your plan options are extremely varied and confusing — and it’s kind of a crap shoot to decide what kind of coverage you’ll need. Your three main options are to go with a manufacturer’s plan, your cell carrier or a third-party insurance plan. Isn’t My Phone Already Covered? Need To Save Cash On Your Cell Service? Isn’t My Cell Phone Already Covered? First, let’s address a few common questions and misconceptions about how your smartphone may already be covered. 1) Why Do I Need Smartphone Insurance If It’s Under Warranty? Most mobile phones come with a limited warranty — but this warranty typically only covers hardware malfunctions and not accidental damage (or the loss or theft of your phone). 2) Are Cell Phones Covered By Homeowners Insurance? Your homeowners or renters insurance usually doesn’t cover your smartphone from accidental damage or loss. Typically, your policy only covers damages resulting from a home fire (or other disaster) or home theft. Even if you had coverage for a smartphone loss under your homeowners policy, you’d still be responsible for your policy’s deductible, which can range from $500 to $2,500. 3) Does My Credit Card Provide Cell Phone Insurance? Many major credit cards extend the manufacturer’s warranty by a year or longer, but it varies on the card. Many also cover loss from theft or damage within the first 90 days after purchase. You can also get damage and theft coverage from select cards — as long as you use them to pay for your cell phone service. These include most consumer cards issued by Wells Fargo, U.S. Bank Visa Platinum, First Citizens Cash Back Rewards Visa and several others. Be sure to check your credit card’s perks. Here, we’re comparing costs, deductibles and other details for 2-year coverage for the iPhone8, one of the most popular smartphones. Keep in mind, your costs, deductibles and benefits will vary based on your phone’s make and model. Samsung phone insurance options also include Samsung Premium Care and GeekSquad. Both of the leading smartphone manufacturers, Apple and Samsung, offer smartphone insurance. See details for each protection plan below the table. Apple also offers the option of AppleCare+ with Theft and Loss protection for an additional cost. Most cell phone service providers offer protection plans that cover loss and theft in addition to accidental damage. Here, we’re highlighting the Big Four carriers. AT&T, Sprint and Verizon cell coverage provided by third-party insurance company Asurion, and T-Mobile’s plan is administered by another insurance company, Assurant. AT&T offers 3 mobile phone insurance plans that cover your phone for out-of-warranty malfunctions, damage, loss and theft and also includes next-day phone replacement. It was difficult to find information about AT&T’s deductibles. Verizon offers 3 cell phone insurance plans that include coverage for damage, loss or theft. Deductibles range from $19-$199, depending on your device. You’ll need to sign up within 30 days of buying your phone. Sprint Complete offers smartphone insurance that covers device malfunctions, damage, loss and theft. Coverage for most iPhones and Samsung phones costs $15 per month, and it’s $19 to cover an iPhone X. You must purchase within 30 days of activation or upgrade. Screen repairs have a $29 deductible, but other deductibles vary based on your device. They range from $65-$140, and replacement deductibles range from $99-$275. T-Mobile Protection covers accidental damage, hardware service (mechanical breakdown), loss and theft. Plans range from $7-$15 per month depending on your device. You must purchase protection within 30 days of your T-Mobile device purchase. T-Mobile also offers a basic protection plan, but you must call them at 1-800-937-8997 for more information. There are a handful of third-party phone insurance providers that are good options to protect your cell phones. As we mentioned earlier, the 4 major cell phone carriers use third-party plans through two different insurance companies: Asurion and Assurant. But neither of these insurers has a policy to purchase directly from them. SquareTrade (an Allstate company) covers accidental damage from drops and spills, as well as mechanical malfunctions. But it doesn’t cover loss or theft, nor does it offer any technical support. SquareTrade’s plan, however, is simple — it offers one plan for $8.99 per month per device, which covers any type of device and you can cancel anytime. Any claim is subject to a $149 deductible. And this applies to leased or purchased mobiles. The upside for SquareTrade? Their monthly cost and deductible for major damage are pretty competitive. But if you only need a cracked screen repair, it’s going to cost you a lot more compared to other plans. If you damage your phone beyond repair, SquareTrade will reimburse you for the value of the phone or provide a replacement. How do consumers rate SquareTrade? SquareTrade has a solid four-star rating from more than 10,000 consumers on Trustpilot. Most reviewers had fantastic customer support experiences and no claims problems. Best Buy’s Geek Squad offers 2 cell phone protection plans, but this coverage isn’t available for iPhones of any make or model. You must sign up for your plan within 15 days of your device purchase. Geek Squad charges you a service fee if your phone is unrepairable and needs replacement. These fees vary widely based on your phone’s purchase price and range from $9.99-$249.99. Unfortunately, GeekSquad has a dismal 1-star rating on both Trustpilot and ConsumerAffairs. A majority of complaints center on poor and unknowledgeable tech reps and long wait times for customer service. However, we couldn’t find much online feedback speaking directly to their cell phone insurance claims process. Upsie gets generally positive customer reviews for their simple process, affordable pricing and fantastic customer support. The downside with Upsie is that it doesn’t offer coverage for loss or theft. Need To Save Big Bucks On Your Cell Service? As you can see, cell phone insurance and extended protection plans aren’t cheap. If lowering your overall cell phone costs is one of your primary goals, you have many options you likely don’t realize. Be sure to check out our reviews of the Cheapest, Best Coverage And Best Unlimited Cell Phone Plans. Many of these monthly service plans won’t necessarily qualify for the insurance we’ve outlined in this article, but if saving money is your top priority, it’s well worth the read. If money’s not as much of a concern and you want to learn which cell phone service is best for your needs, read our reviews of the Best Cell Phone Carriers. 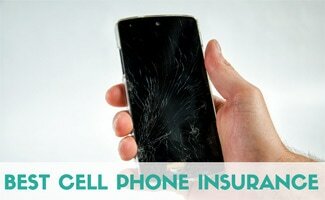 Why do you think investing in cell phone insurance may be worth it?